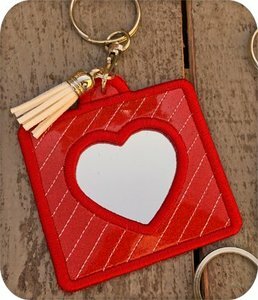 Our unique key rings have mirrors inside! These designs fit well within a 4x4 hoop. 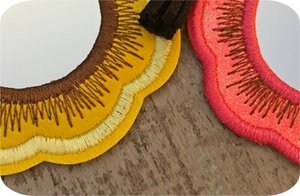 5x7 Hoop - 4.96" x 6.75"
7x12 Hoop - 6.50" x 11.57"
You have the option of a satin stitch edge or a trimmed edge. Detailed instructions are included. 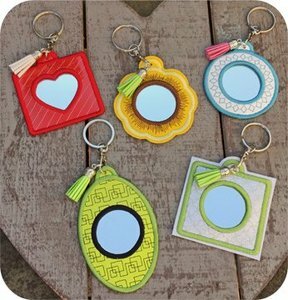 Use marine vinyl or glitter mirror sheets to make these. 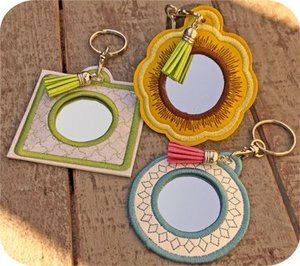 Our mirror key rings make great gifts and coordinated nicely with our 'in the hoop' purse and bag designs!